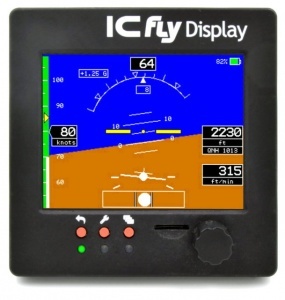 The ICflyDisplay brings the artificial horizon of the ICflyAHRSII into the cockpit. The sunlight-readable touchscreen guarantees a clear representation even in direct sunlight, as well as a simple usability. All settings are configurable via an intuitive menu operated by a high-feedback rotary encoder. 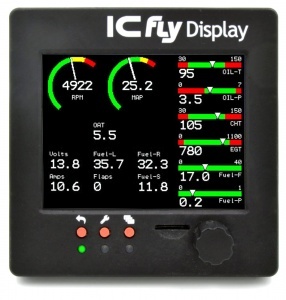 The ICflyDisplay has 2 ICflyBus connectors that supply operating voltage and horizon- / motordata. It can be added to an existing ICfly-System easily. It is possible to operate two or more devices in a row on the same bus. The ICflyDisplay can be either configured using the internal menu or by several configuration files on the microSD-card. Up to now the ICflyDisplay supports the following configuration files. The features described in this chapter are available since firmware version 1.00. A soon as the ICflyDisplay has been started once, with microSD-card inserted, initial configuration files are stored on the card. To modify the files, remove the microSD-card from the ICflyDisplay and open the files with a text-editor on a computer. The card-socket is a push & push type. So to remove the card, you have to push it inwards first. The microSD-card should contain the config-files mentioned above. Their structure and influence on the configuration of the ICflyDisplay is described below. It contains all settings of the serial interfaces of the ICflyDisplay. Editing the values in the upper half of the file changes the baud rates of the serial interfaces. The lower half of the file selects the data sources for horizon-/ motor- and traffic-view. The displayed configuration sets all baud rates to 230400, the sources for horizon-/ motor- and traffic-data to Up1 / Up2 and Dwn1. Please notice, that only the listed values are valid. It contains all general settings of the ICflyDisplay. Here the QNH-value, the display-brightness and the start window can be modified. Start Window means the mode, the display starts operating in (0 -> horizon view, 1 -> motor view, etc.). You can enable/disable certain Views with Enable Views (0 -> View disabled, 1 -> View enabled). Normally you do not have to define instruments by yourself. The MotorView.txt-file contains one instrument for every data channel of the ICflyMotorbox 912. Some instruments are just set invisible. To personalize the motor view, simply make the required instruments visible by setting their v-value to 1 and place them in the desired location on the screen by setting the px- and py-values accordingly. The origin (0/0) of the coordinate system is located in the lower left corner of the screen. It allows changing the distance where the Display show a warning. The warning zone is a cylinder with radius SafeRange and height 2x SafeAltitude. Please refer to the datasheet - Section 9: "Firmwareupdate via SD-Card" for instructions. The firmware of the ICflyDisplay can be updated via SD-Card. This functionality is available since firmware version 1.01. Please refer to the table below for all available firmware-updates. This page was last modified on 20 February 2019, at 14:52. This page has been accessed 7,621 times.